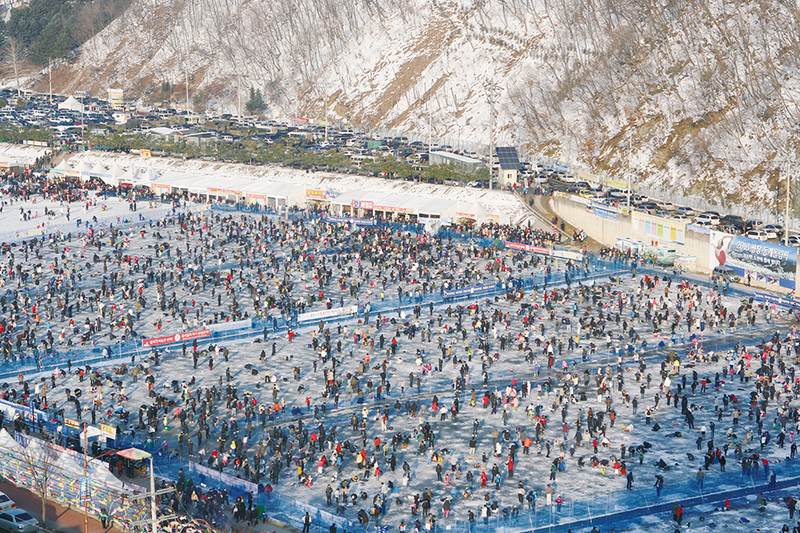 [dropcap letter=”T”]he frozen Hwacheon Stream of the rugged mountain town of Hwacheon plays host to the annual Hwacheon Sancheoneo Ice Festival, named by Lonely Planet in 2011 as one of the “world‘s top seven winterland marvels.” Every year, about a million people flock to the piece of central Korea to try their hand at ice fishing, do some sledding, take in the ice sculptures and engage in other varieties of winter fun. A land of towering peaks, rushing rivers and one of Korea‘s largest lakes, Hwacheon is home to the sancheoneo, a mountain trout indigenous to the cold, clear waters of this region. The fish also makes for some seriously good eating, making the rivers here one of the most popular ice-fishing destinations in the country. During the festival, visitors try their luck at specially prepared ice fishing spots on the Hwacheoncheon Stream. You don‘t have to be especially lucky to catch one – every day of the festival, some two tons of trout are put in the stream. The really stout-of-heart try catching the fish with their bare hands. Rest assured, it‘s a bracing experience. Best of all, you can, and should, eat what you catch, and there are barbecue pits set up all around the festival venue where you can broil up your fish – they are lovely with a pinch of salt. EAT> Most people come for the sancheoneo, but if you’d like something else, Hwacheon Eojuktang (T. 033-442-5544), located in front of Hwacheon Hydroelectric Power Station, does a mean eojuktang (spicy fish stew) on the cheap. 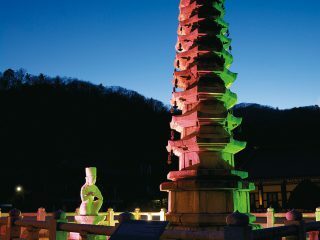 DO> Hwacheon has a city tour bus that takes you to the town’s scenic and cultural sites. 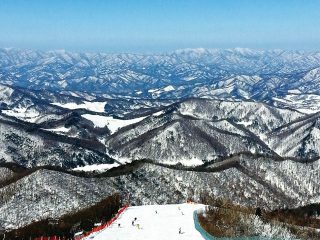 Buses depart from Chuncheon Station (in the nearby city of Chuncheon) at 10 AM, and there are two courses available. SEE> Really off the beaten track is Peace Dam, a rather curious piece of Cold War history that has been turned into a peace park. GO> Buses to Hwacheon-gun depart from Dong Seoul Terminal (travel time: 3 hours). The Mungyeong Saejae (“Bird Pass”) has long been one of the most strategic roads through the rugged Sobaeksan Mountains, which separate Korea’s southeastern region from Seoul and its surroundings. 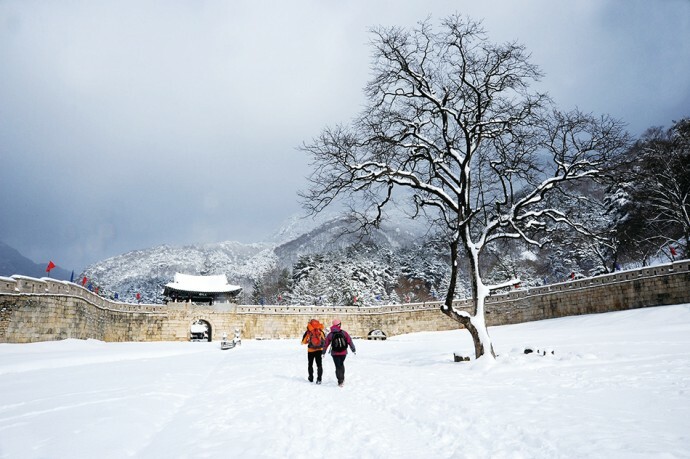 During the Joseon Dynasty, a series of three fortress walls were built in the pass to defend the capital from invasion from the south and to keep the road clear of mountain bandits and the like. Restored in 1976, the gates now cut an impressive figure against the steep mountain peaks that flank them on both sides. In addition to the gates, you’ll also find ruins of a Joseon Dynasty inn, plenty of hiking opportunities in the surrounding hills, one major Buddhist temple and, oddly enough, a recreated Goryeo Dynasty city used by KBS as a film set. EAT> There are plenty of good eateries at the entrance of the park. The Mungyeong Sikdang (T. 054-571-3044) does a variety of dishes made with red pepper paste made with omija, a flavorful berry for which Mungyeong is famous. Try the omija gochujang bibimbap, a bowl of rice and seasoned vegetables mixed with omija-infused red pepper paste. STAY> Mungyeong Tourist Hotel (T. 054-571-8001) is a good place to stay and located right in the park itself. DO> It takes about two hours to walk from the first gate to the third. GO> Take a bus to Mungyeong from Seoul’s Dong Seoul Bus Terminal (travel time: 2 hours, 30 minutes). From Mungyeong, take Bus 100 to the park (travel time: 15 minutes). 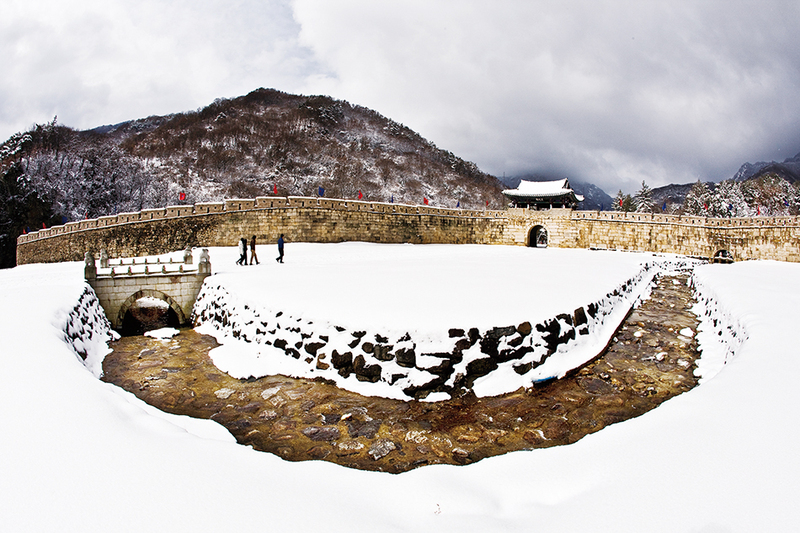 One of this writer‘s favorite winter destinations, Namiseom is an island in the Bukhangang River about 30 minutes from downtown Chuncheon. In 1965, Minn Byeong-do, former governor of the Bank of Korea, purchased the island and transformed it into one of Korea’s most splendid arboretums. 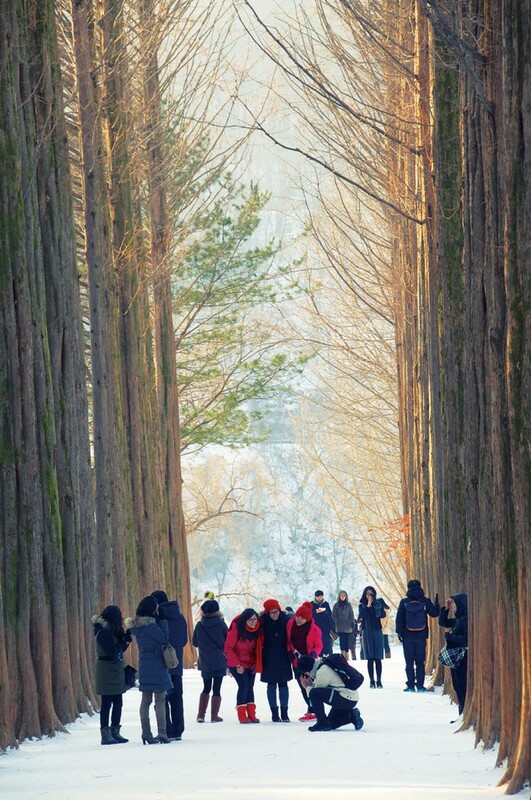 The island is criss-crossed with wooded walking paths, the most famous being the Metasequoia path featured in the hit 2002 drama “Winter Sonata,” one of the shows that kicked off the so-called “Korean Wave.” It‘s as popular a destination in winter as it is in summer thanks to both the drama and its beautiful snowy scenery. In addition to the trees and snow, the island is home to exhibition spaces, performance halls, restaurants, cafés and a very good hotel. EAT> Namiseom has got a good variety of eateries, including a Chinese restaurant, a pizzeria, a Korean-style lunchbox café and a joint selling Chuncheon’s best known contribution to Korean cuisine, spicy grilled chicken, or dak galbi. STAY> The Naminara Hotel (T. 031-580-8000) is a great place to stay. The hotel’s rooms are decorated with the works of noted artists, turning a night here into a cultural experience. DO> The Namiseom Zip Wire takes you nearly a kilometer across the river to Namiseom, beginning at a height of 80 meters. SEE> Everybody goes to the Metasequoia path, a tunnel created by the giant Metasequoia trees that line the walkway. GO> First, take the train from Cheongnyangni Station in Seoul to Gapyeong (travel time: about 1 hour). 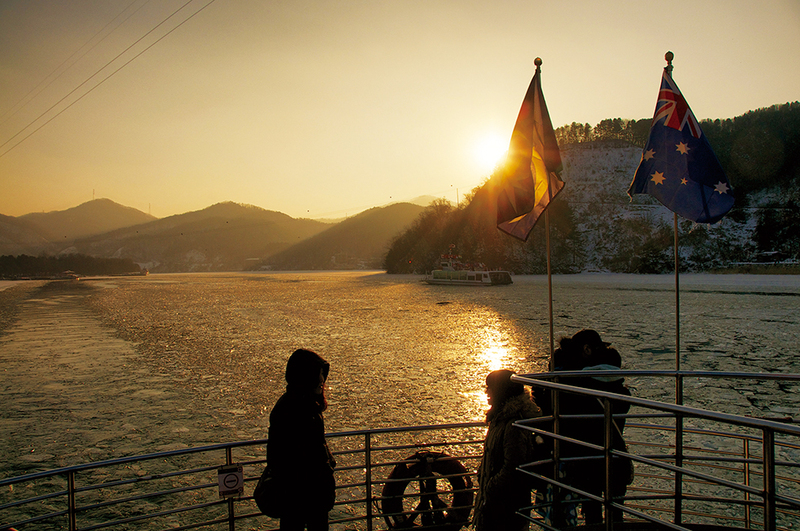 From Gapyeong Station, take a taxi to Namiseom’s parking lot (travel time: 10 minutes). From there, you can catch a ferry to the island. 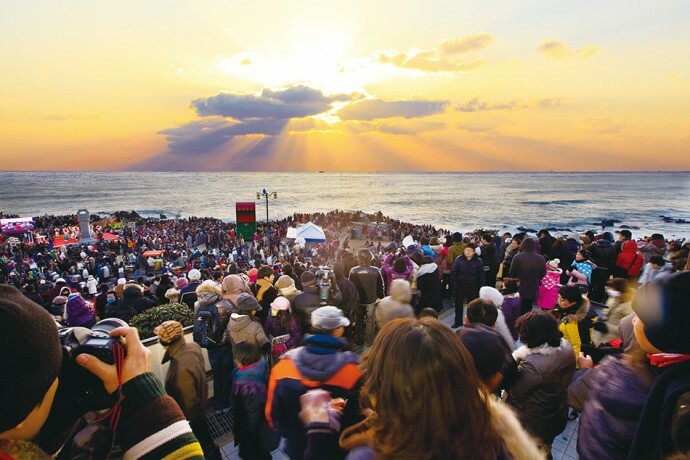 The earliest sunrises in Korea can be enjoyed from the Ganjeolgot Cape in the southeastern city of Ulsan. At the cape you‘ll find a lighthouse, some sculptures and a very large post box (the world‘s second largest! ), where many visitors put postcards on which they‘ve written their wishes. Most folk come to either watch or photograph the sunrise, although ideally, the two activities are not mutually exclusive. EAT> You’ll find a restaurant and café at the cape, but if you’d like to try Ulsan’s most famous specialty, check out the whale meat restaurants near the Ulsan Whale Museum. STAY> Ulsan has a wide range of accommodations, including high-end options like the Hyundai and Lotte hotels. DO> If you’ve got a car, the coastal ring road is one of the most beautiful drives in the country. GO> The KTX to Ulsan departs from Seoul Station. Take Bus 5001 from Ulsan Station to City Hall, and from there, transfer to Bus 715 and get off at Ganjeolgot. The dead of winter might seem an odd time to visit a green tea plantation, but the rolling hills of Boseong’s tea country play host to one of Korea’s most visually appealing winter festivals, the Boseong Green Tea Plantation Light Festival. 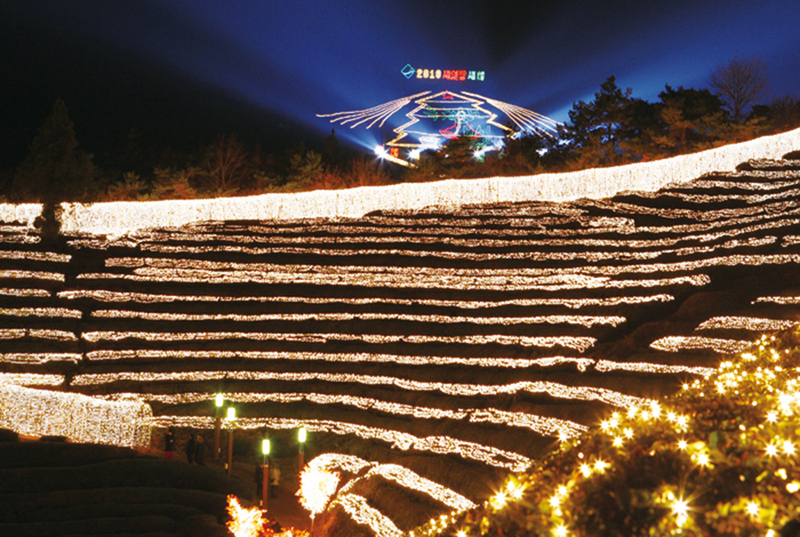 The terraced fields of Botjae Dawon plantation are lit up in thousands of multicolored lights as a message of hope for the New Year. 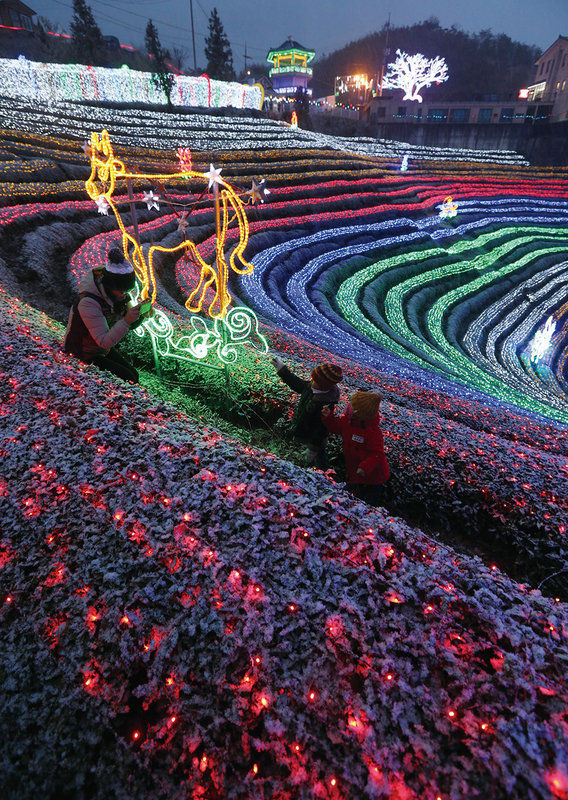 The decorations include a giant, 120-meter-high “tree” made of LED lights, one of the world’s largest. Most, however, come just to walk amidst the terraced tea fields illuminated against the dark winter sky. EAT> Green tea ice cream, green tea noodles and delicious green tea pork; you’ll also be drinking lots and lots of green tea. STAY> The Boseong Tourist Hotel (T. 061-853-1144) is the most convenient place to stay, but if you’re looking for something a bit more historic, the nearby hamlet of Beolgyo is home to the Boseong Yeogwan (T. 061-858-7528), an old colonial era Japanese inn with rooms to rent. SEE> The best views are from the top of Botjae Dawon’s main hill. DO> While you’re in Boseong, take a green tea and sea water bath at Haesu Nokchatang on Yulpo Beach. GO> Buses to Boseong depart from Seoul Express Bus Terminal (travel time: 4 hours). From Boseong, take a bus for the Green Tea Plantations.